Fannie Mae and Freddie Mac have both begun implementing their own appraisal waiver programs where an automated appraisal alternative will be accepted in lieu of a traditional appraisal. While the full extent and effects of such programs remain to be seen, this is an issue that appraisers will want to follow closely. Those properties that will qualify for the PIW on refinance transactions include one-unit properties, including condominiums, principal residences, second homes, and investment properties. The PIW will extend to limited cash-out refinance transactions up to a 90 percent LTV/CLTV for principal residences and second homes, and up to 75 percent LTV/CLTV for investment properties. Scott Reuter, Freddie Mac’s Chief Appraiser and Director of Valuation, is a second generation appraiser, holds a Certified General credential, and has over 30 years of experience in valuation and risk management. Reuter leads a team of 10 Certified appraisers and reports that he and his team will be monitoring the accuracy of the automated tools to test their results. “As we begin the initiative, we’re going to sample data from the portal and order independent desk reviews of properties, with all of that information going through an internal review team. We can then refine the systems and improve our models. This will ensure that whatever we do from a valuation process perspective aligns with our view of quality,” says Reuter. In terms of what Freddie is hoping to accomplish by offering automated collateral evaluations (ACEs), Reuter says the goal is to better serve the public. “An appraisal is part of a risk decision. If there is a subset of loans where we can make that risk decision without an appraisal by leveraging responsible innovation, then we should do that. Our charter calls on us to provide liquidity; it doesn’t say ‘order an appraisal on every single property.’ While the ACE is something that goes counter to my appraiser DNA, I understand it and for a small subset of the safest loans, Freddie’s goal is to better serve the public,” Reuter reports. When asked why Freddie is choosing to offer ACEs on purchase transactions, going a step further than Fannie Mae’s initiative which only offers waivers on select refinances, Reuter says that the decision will be based on a variety of factors. “A purchase transaction brings together an independent buyer and seller at an arm’s length. They have agreed on a variety of things, including market value, independent data points, and the property’s valuation. Properties go through a tremendous amount of rigor. So in areas where we have very rich or robust analytics on a county or MSA level, and the buyer is bringing 20% down or more, then it might be appropriate to offer an ACE,” says Reuter. For appraisers worried about the end of a profession, Reuter argues that is not the case. “We will overwhelmingly still need to order, grade, score, and consume appraisals. Our data systems are modeled off of appraisal data, so it won’t work without appraisals. But, that doesn’t mean we will need appraisals on 100 percent of loans,” Reuter says. A good comparison is a local accountant who prepares tax returns, according to Reuter. TurboTax and other “Do-It-Yourself” tax software undoubtedly took work away from local accountants and tax professionals, but many people, even small business owners like appraisers, might still need the services of an experienced accountant. “What that local accountant has lost, due to new software and technological innovation, is the 20-something year old’s return, the college students, and the part-time workers. Simple tax returns can now be done by taxpayers, but there is still a demand for tax professionals. Some appraisers are upset that the cookie-cutter appraisals may not be in such demand in the future, but demand for appraisal services will continue on more complex assignments, rural areas, and where we don’t have sufficient data. We expect a significant majority of the mortgage loans to require traditional appraisals,” argues Reuter. These latest changes by Fannie and Freddie prompted the Appraisal Institute (AI) to write a letter to Freddie Mac’s regulator, Mel Watt, Director of the Federal Housing Finance Agency, warning that Freddie Mac’s decision to waive appraisals for first-purchase transactions is especially risky because these are “transactions with the highest risk to the agency.” Unlike refinance transactions where previous appraisal information is typically on file, the AI points out that purchase transactions “generally have less information available to the agency” and that forgoing an appraisal omits valuable data such as the appraiser’s interior inspection, the condition of the property, and more. AI’s letter also makes an important point that appraisal alternatives or “waivers” are nothing new. Leading up to the real estate crash of 2007- 2008, Fannie and Freddie were issuing appraisal waivers en masse. After the GSEs were taken into conservatorship back in 2008, it was discovered that as many as 30 percent of mortgage loans held by Fannie and Freddie had received such waivers, according to AI. Even after the crash, a separate report from the Government Accountability Office reports that Fannie and Freddie only required appraisals for 85 percent of the mortgages they purchased in 2010 and 94 percent in 2009. In other words, the GSEs have long used AVMs or waivers as alternatives to appraisals and the practice dates back to the early 2000s. However, AI warns that Freddie’s latest move to use these tools for first purchase transactions is especially foolish. “Freddie Mac’s decision to veer away from fundamental risk management practices appears to harken back to the loan-production driven days in the years leading up to the 2007-2008 financial crisis…which turned out to be disastrous for the entire economy,” the AI warns. Appraisers have responded to Fannie and Freddie’s new changes with a mix of shock, outrage, indifference, and a few “I told you so’s.” Richard Hagar, SRA argues that while change is coming to the industry, appraisers are and will remain an integral part of the valuation industry. 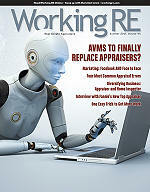 “AVMs are not going to take over the job of an appraiser any time soon. Houses change: some get larger, some remodeled, some add an accessory dwelling unit (ADU), some have massive interior damage, while others burn down. County records rarely or very slowly reflect those changes,” Hagar says. Another reason that appraisers will be needed well into the future is that automation gets stale quickly when fresh data stops flowing in. “AVMs need lots and lots of current data. They need appraisers to feed the beast with updated information regarding the condition of the subject property, surrounding uses and market changes. Without appraisers submitting updated information, the accuracy of the AVMs begins to degrade within six months,” says Hagar. In terms of valuing commercial property, Hagar says the accuracy of AVMs gets even worse. “AVMs fail miserably when valuing most commercial properties. The primary value component of commercial properties is the income and it takes humans to coax monthly income amounts out of most commercial building owners. Can you imagine some machine calling up an owner of a multi-million dollar shopping complex and asking for the monthly income and vacancy factor? Human interaction and in-depth market research are needed to uncover vital commercial data, so an appraiser’s expertise on the commercial side is indispensable,” argues Hagar. While AVMs won’t replace appraisers, Hagar notes they are by no means “useless” (as some appraisers argue) and their use can be expected to continue in the future. “AVMs have a place in a valid business model when it comes to providing yearly updates on the value of a block of loans held by banks, Fannie Mae and most private lenders. Many of these institutions have hundreds of billions of dollars’ worth of mortgages, and regulations require banks to compare existing loan balances on a portion of mortgages against current property values. AVMs do this quickly and reasonably for the dollars spent,” says Hagar. The solution, according to Hagar, is for appraisers to embrace technology to improve their practice. “We appraisers are no stranger to change. The practice of appraising real estate continues to evolve and it should come as no surprise that more is now being required of appraisers than ever before in terms of support, techniques and data analysis. If appraisers fear that the increased use of AVMs will replace us, then we should up our game, and provide a product that is better than the output of a computerized AVM. Appraisers who are willing to adapt and leverage technology to improve their techniques will see it pay off in spades. The real estate industry will long have a need for professional appraisers who are masters of their craft and provide up-to-date, supported, and market driven opinions of value,” says Hagar. Isaac Peck is the Editor of Working RE magazine and the Director of Marketing at OREP.org, a leading provider of E&O insurance for real estate appraisers, inspectors and other real estate professionals in 50 states. He received his Master’s Degree in Accounting at San Diego State University. He can be contacted at Isaac@orep.org or (888) 347-5273. 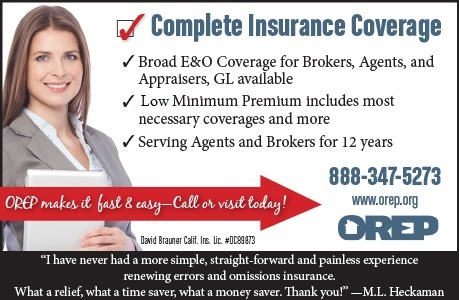 OREP Insureds enjoy guaranteed delivery of each print magazine and many more benefits !